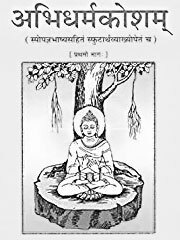 Abhidharma-kośa, a key Abhidharma text in verse written by Vasubandhu, summarizing Sarvāstivādin tenets in eight chapters with a total of around 600 verses. As well as the original Sanskrit, translations exist in Tibetan, Chinese and Mongolian, as well as English and French. Vasubandhu wrote an auto-commentary to this, the Abhidharma-kośa-bhāsya in which he critiques the interpretations of the Sarvāstivādins and others of the tenets he presented in that work. This commentary includes an additional chapter in prose refuting the idea of the «person» (pudgala) favoured by some Buddhists. A large number of sub-commentaries on this text have been preserved in Tibetan translation.